There’s no better firearm for short distance, broad coverage “point and fire shooting” than a shotgun.. Although we tend toward black tactical firearms there are a few types of guns that are so iconic that we have them in our collection too. One of these is a “lever action” firearm. The only problem that we had is that we really aren’t into collecting firearms from the Old West (like the classic Winchester 1866 “Yellowboy” or the 1873 “Model 73” - “the Gun that Won the West”), so what to do? Luckily in 2017 Henry came up with a solution that we really liked; a .410 bore lever action shotgun – with either a 20” or 24” barrel. The criteria that we use to evaluate lever action shotguns are: 1) length, 2) weight, 3) number of shells in the tube, 4) reliability, 5) accuracy and 6) price. Both Henry firearms are based on Henry’s blued steel-framed .45-70 Lever Action guns. They are tube-fed and hold five 2 ½” shells (note: they only use 2 ½” shells). Cosmetically they have a round blued barrel, dark straight-grained American walnut stocks and foregrips with checkering fore and aft, and a non-slip ventilated black rubber recoil pad at the rear. Since the 20” variant (H018-410R) has a smooth cylinder bore “choke” (a tapered constriction of the gun barrel’s bore at the muzzle end) and adjustable semi-buckhorn rear and brass bead front sights we thought that it would be more versatile - and consequently purchased it. The 20” Henry .410 measures 40.5” long and weighs 7.33 lbs. It has a pull length of 14”, a “transfer bar” safety that ensures the firearm cannot actuate the firing pin by the hammer unless the trigger is pulled and has been predrilled/tapped for Weaver 63B attachments. The firearm also comes with swivel studs both fore and aft so that you can easily add a sling if you want to do that. If you want a .410 with a removable choke the 24” variant (H018-410) has an invector style full choke and large front brass bead, with no rear sight. We preferred the 20” variant since its adjustable sights make it more maneuverable and easier to regulate patterns with a variety of birdshot and slugs. 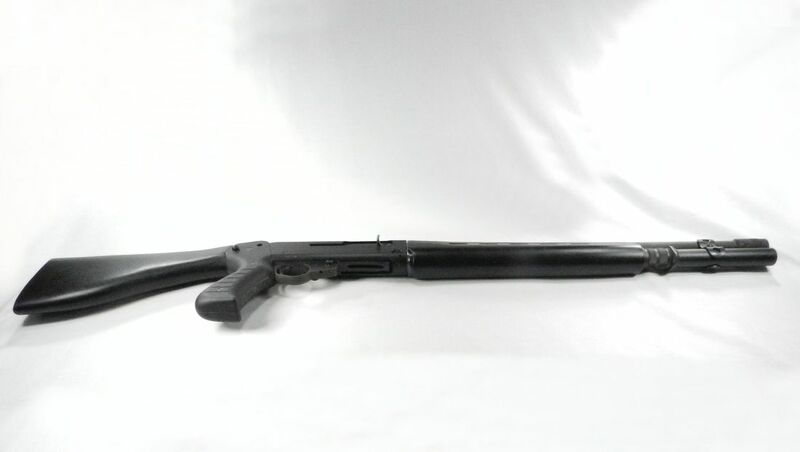 You can buy this shotgun at henryusa.com or your local FFL dealer. If you would like to see a detailed YouTube review of the Henry .410 Lever Action shotgun - Iraqveteran8888 has a good one here and Buffalo's Outdoors has another good one here. Visually inspecting the rim thickness of the Fiocchi shells shows that they might be slightly less thick (we would need micrometer to really check) – but we suspect that the height of the brass (~9/16” on the Winchester AA Super Sport Sporting Clay Target Load Shotshells .410 gauge 2 1/2" #8 - AASC418 and only ~5/16” on the Fiocchi shells) might be the real culprit since the shorter brass is probably weaker and more likely to expand when fired. So we switched to using Winchester shells and everything’s been fine since then. If you are looking for a home defense weapon then a tactical shotgun is a good choice since it has a lot of firepower in the short distance. The criteria that we use to evaluate tactical shotguns are: 1) length, 2) weight, 3) number of shells in the tube, 4) reliability, 5) accuracy and 6) price. Our choice of tactical shotguns in the market was the Benelli SuperNova 12 Gauge Tactical pump shotgun. This firearm is a pump action with a 4+1 capacity (for 2 ¾” shells). The firearm measures 40" long and weighs 7.6 lbs. It has a skeletal steel framework with a black synthetic polymer molded over it, a pistol-grip stock, Ghost-ring sights and a forend shell-stop button. The length of the pull is 14 3/8". The feel of this shotgun is just great, and since it is a Benelli it works like a charm. At the range I often see other shotguns jam up. Not this gun. We also like the 40” length since it makes it very manageable in a tactical environment where a long barrel will just knock into everything. You should be able to buy this shotgun at your local FFL dealer. ​Information about the SuperNova can be found at BenelliUSA.com. If you would like to see a detailed YouTube review of the Benelli SuperNova Tactical Pump Shotgun - Only the Best Firearms & Accessories has a good one here. If you want more speed in a shotgun than a pump will give you - then you need a semi-auto shotgun. The criteria that we use to evaluate tactical semi-auto shotguns are the same that we use for a pump shotgun: 1) length, 2) weight, 3) number of shells in the tube, 4) reliability, 5) accuracy and 6) price. For this application we have a Franchi Law-12 semi-auto shotgun. This firearm has a semi-auto action with an 8+1 capacity. The firearm measures 41 ½” long (with a 21 ½” barrel) and weighs 7.25 lbs. The Franchi Law-12 was developed from the pump/semi SPAS-12 but is lighter in weight and is simpler to operate since it works only in the semi-auto mode. The Law-12 gas pistons were designed as two pieces unlike the one piece design of the SPAS-12, so they are not interchangeable. The firearm has two manual safeties, both located at the front of the trigger guard. One is called the quick-employment safety, and works in a manner similar to that of an M-14 or Garand rifle. The second safety is a more traditional cross-bolt safety (assuming that the replacement of the original lever action safety that was rotated 180 degrees to get from the safe to the fire position has occurred, as recommended by a Franchi in an August 1991 recall). Disassembly is similar to, but simpler than, that of the SPAS12. 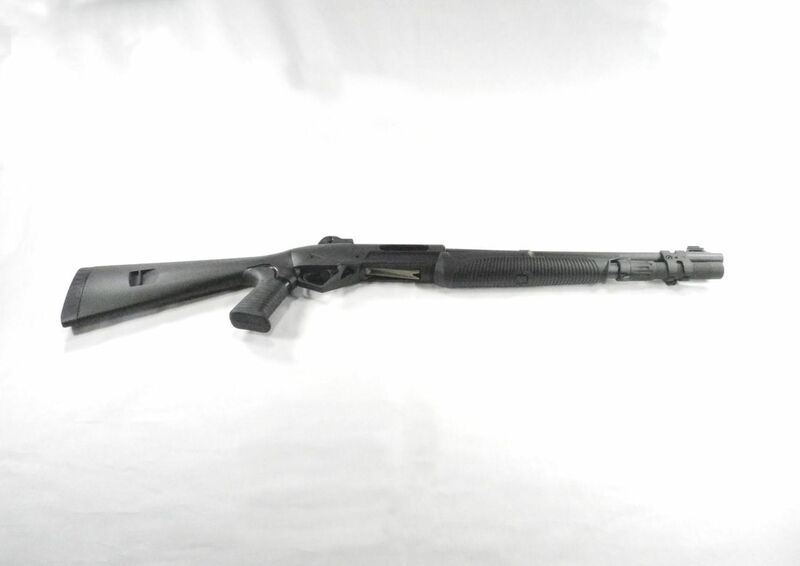 Since you will probably not be able to buy this shotgun at your local FFL dealer, you will probably need to go to gunbroker.com to find a previously owned one that someone else is selling. If you would like to see a detailed YouTube review of the Franchi Law-12 Semi-Auto Shotgun - spas12project has a good one here. Because I like the Franchi Law-12 semi-auto shotgun that I have, I decided to also purchase its somewhat quirky, but definitely cool looking, sister; the Franchi SPAS-12. The SPAS-12 is a dual-mode shotgun, adjustable for semi-automatic or pump-action operation with an 8+1 capacity. The firearm measures 41” long (32 ½” with the stock folded), has a 21 ½” barrel and weighs 8.75 lbs. Although the SPAS-12 is not the most practical shotgun - since it is a heavy firearm and takes some getting used to because of the dual safeties and the dual mode gas-piston system controls – it is a really nice range toy. 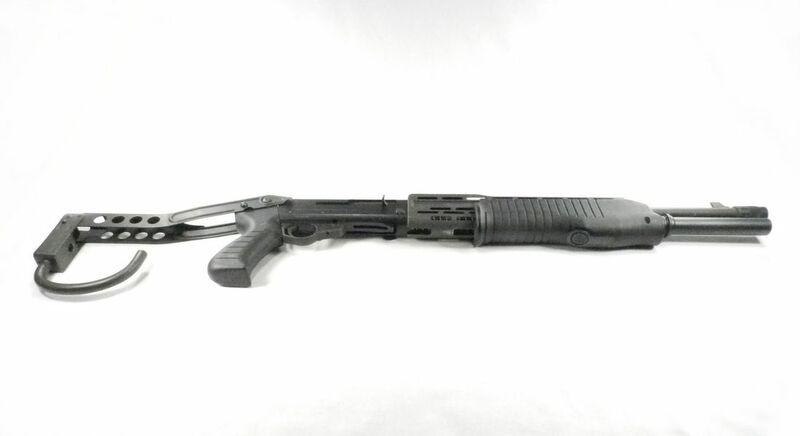 Since you will probably not be able to buy this shotgun at your local FFL dealer, you will probably need to go to gunbroker.com to find a previously owned one that someone else is selling. If you would like to see a detailed YouTube review of the Franchi Spas-12 Semi-Auto/Pump Shotgun - spas12project has a good one here. Although we like our Franchi Shotguns (Law-12 and SPAS-12) and our Benelli SuperNova, we also wanted to have a shotgun that combined the best of all of these – both semi-automatic and modern. Since we like the action, quality, fit and finish of our Benelli SuperNova we decided to purchase what is essentially the semi-auto version of the same firearm; the Benelli M2. The criteria that we use to evaluate tactical shotguns are: 1) length, 2) weight, 3) number of shells in the tube, 4) reliability, 5) accuracy and 6) price. The M2 has an Inertia Driven action with a 5+1 capacity (for 2 ¾” shells). The firearm measures 39.75" long and weighs 6.7 lbs. It has a skeletal steel framework with a black synthetic polymer molded over it, a pistol-grip stock, Ghost-ring sights and a ComforTech stock. The length of the pull is 14 3/8". The biggest difference between the SuperNova and the M2, besides the action, is that the M2 is designed to support internal chokes while the SuperNova has a “Fixed Cylinder” choke. The M2 comes with 3 internal flush Crio® chokes: Improved Cylinder (IC = 4 notches), Modified (M = 3 notches) and Full (F = 1 notch). Benelli has two other “standard” Crio® chokes that you can purchase separately: Cylinder (C = 5 notches) and Improved Modified (IM = 2 notches). 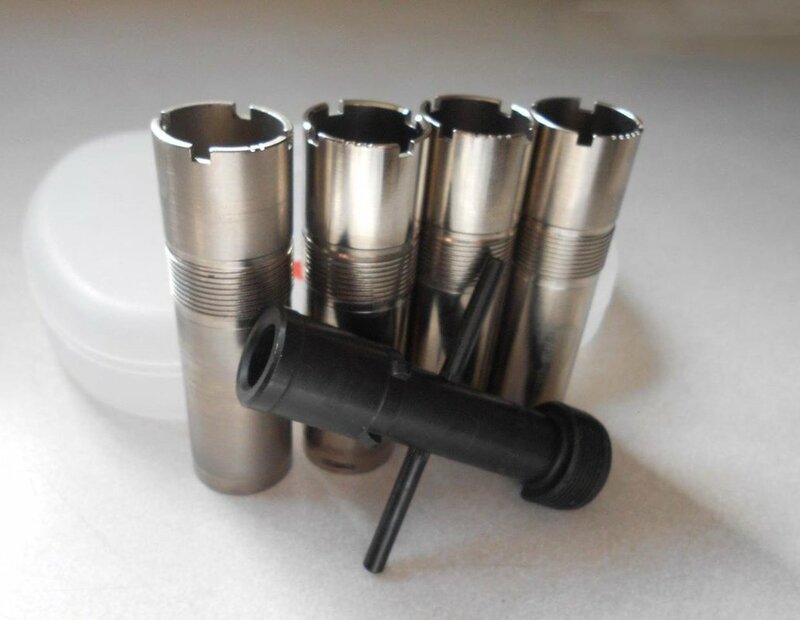 You can also by a wide variety of flush or extended chokes from a variety of other specialty manufacturers (e.g. Trulock, Briley, Carlson’s, etc.,). 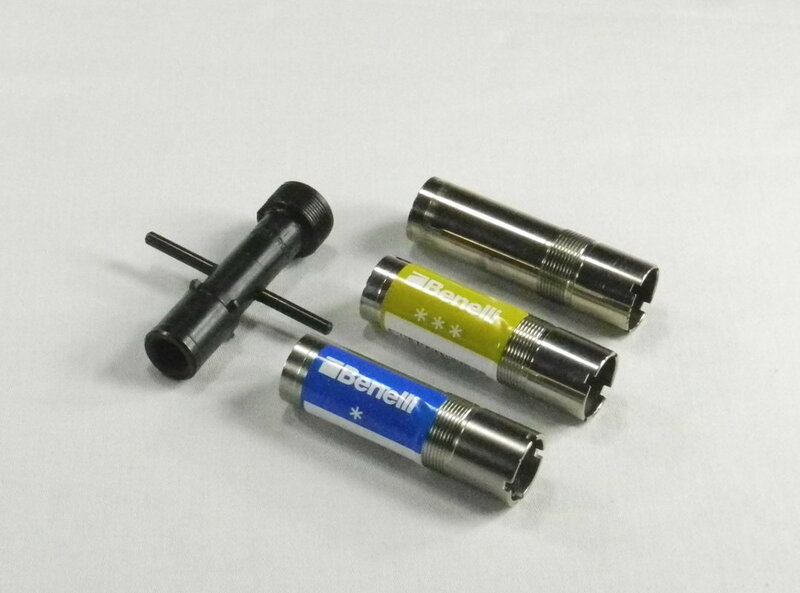 ​In my case I found a Benelli Factory Choke set (F0285901) that had four chokes on eBay: Improved Modified (IM/2), Modified (M/3), Improved Cylinder (IC/4), Cylinder (C/5), a choke wrench and a small plastic carrying case for the chokes and wrench. So with these chokes I have a complete set of the chokes I need plus duplicates of the Improved Cylinder (IC/4), Modified (M/3) and wrench. ​The feel of this shotgun is just great, and since it is a Benelli the action is smooth and reliable. We like the ~40” length since it makes it very manageable in a tactical environment where a long barrel will just knock into everything. You should be able to buy this shotgun at your local FFL dealer. ​Information about the M2 can be found at BenelliUSA.com. If you would like to see a detailed YouTube review of the Benelli M2 Semi-Auto Shotgun – hickok45 has a good one here.